The line runs through southern Scotland passing through an area with little population from Carlisle until it reaches Motherwell. The area is farmed an in the area around Beattock Summit there is forestry. The M74 follows the line for much of its route. This line runs from Carlisle to near Law. 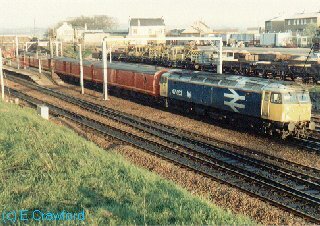 There was a branch to Edinburgh and a further line between the north of Coatbridge and near Larbert which connected the line to other lines running to Stirling, Perth, Dundee and Aberdeen. From Carlisle to Glasgow, Edinburgh and Greenhill (near Falkirk). Today the railway is signalled from Carlisle and Motherwell at power signalboxes. The routes of the Wishaw and Coltness Railway, Monkland and Kirkintilloch Railway and Garnkirk and Glasgow Railway were used to reach the Glasgow terminus at Townhead. At Greenhill the line joined the Scottish Central Railway. Later the Monkland and Kirkintilloch Railway was by-passed by an extension of the Garnkirk and Glasgow Railway to the Wishaw and Coltness Railway. Also have a look at this map from the Caledonian Railway Tourist Guide. Here the lines of the station all joined together running north. There was a goods yard here - before that there had been locomotive sheds here. The lines approaching Carlisle were re-modelled here a number of times. Here the Dentonholm loop, which ran through to London Road, joined the main line at a north facing junction. Here the Caledonian Railway's branch to Canal Junction (on the Carlisle and Port Calisle Railway & Dock Co) left the line. The junction faced south. This was the location of a steam locomotive shed. On closure a new shed was opened on the opposite side of the main line. This shed is also closed. This marshalling yard was planned as part of the 1950s modernisation scheme. The marshalling yard was to replace a number of smaller inconvenient yards scattered all over Carlisle; more or less one per original pre-1923 company. 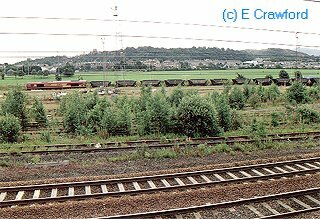 The yard is now mainly dismantled and the sidings face south although they may be reversed into by trains from the north without fouling the main line. The photographs here (taken quite late in the evening) show the partly dismantled yard from the road overbridge at the south of the site. This south facing junction gives access to the military establishment at Longtown. The main junction is slightly further north. The line to Longtown is partly along the course of the former Border Union Railway which had a branch from Longtown to Gretna where it had it's own station close by the Caledonian Railway's one. This south facing junction gives access to the military establishment at Longtown. There is an auxilliary junction slightly further south. The line to Longtown is partly along the course of the former Border Union Railway which had a branch from Longtown to Gretna where it had it's own station close by the Caledonian Railway's one. This north facing junction is closed and lifted. The line to Longtown is was the former Border Union Railway which had a branch from Longtown to Gretna where it had it's own station close by the Caledonian Railway's one. This station is now closed. The station building remains but the platforms have been cut back. This is the junction for a secondary route from Carlisle to Glasgow. It was not always this way; formerly this secondary line was the main line of the Glasgow and South Western Railway who had close affiliations with the Midland Railway in England.. The line from here to near Kilmarnock was built by the Glasgow, Dumfries and Carlisle Railway. This route now has long sections of single track. This station is now closed but loops remain for goods traffic. This was the site of Britain's worst railway accident. This north facing junction was close to Kirtlebridge station. This was the junction for the Solway Junction Railway which crossed the Solway Firth on a viaduct longer than a mile. This goods yard is closed. This station remains open. There are some goods sidings and a passing loop. Formerly there was a locomotive shed here. To the north of the station was a south facing junction for Dumfries via the Dumfries, Lochmaben and Lockerbie Railway. 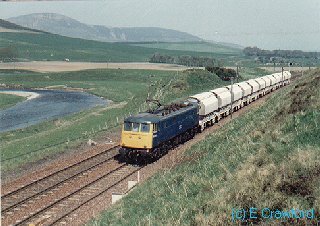 This line and running powers over the Castle Douglas and Dumfries Railway gave the Caledonian Railway access to Stranraer over the Portpatrick Railway. The Caledonian Railway was in fact to run the line to Stranraer for a considerable number of years despite the fact it was 'within the area' of the Glasgow and South Western Railway. The tracks to the left are used by maintenance trains. Part of a bay platform remains here and further to the right is a loading bank. Although the station here is closed, although there are plans to re-open it. There are loops used by freight trains and a number of sidings. Formerly there was a branch for the Moffat Railway. There was a locomotive shed here which provided engines for banking assistance to Beattock summit. This box was between Beattock Summit and Elvanfoot. The viewpoint known as "Greenhillfootstairs" overlooks this location. There is an access road to the line here today. This viaduct crosses the former route of the A74. The photograph looks east. I was the passenger in this car! This station is closed. There was a junction here for the Caledonian Railway's Leadhills and Wanlockhead Branch which ran from a north facing junction to Leadhills and Wanlockhead where there was much mining activity. Part of this branch has been re-opened as a narrow gauge railway. Little remains of this station other than the approach road. There was a branch from here to Camps Reservoir (to the north) which was used during the construction of a dam. The former station at abington has has two loops from the main line and some sidings usually used for maintenance trains. The view looks north. This signalbox no longer exists. A freight train heads south at the former Lamington station as the sun sets behind it. 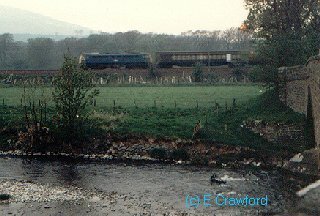 A empty limestonte train from the Ravenscraig steelworks runs south with the Clyde by the line and Tinto hill behind. This station is closed. A new hosue occupies the space of the former station building. This station is closed. Some small traces of platform remain. This was the junction for the former branch to Peebles. This was the Symington, Biggar and Broughton Railway. This station is closed. A station building remains, but the platforms have been removed. There was a line to the east of Carstairs junction which eased the curve through the junctions - this line is now closed and has reverted to farmland. To the south of the junction the line crosses the Float Viaduct and to the south of this were the Strawfrank watertroughs which allowed locomotives suitably equiped to top up their watertanks without needing to stop. Formerly Strawfrank Junction. 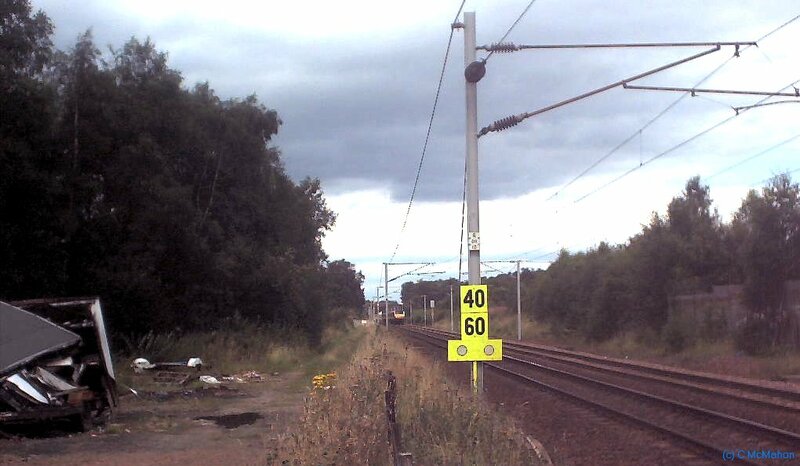 This is the south facing junction between the lines to Glasgow and Edinburgh. The station here consists of a board island platform on the line from Glasgow to Carlisle and Glasgow to Edinburgh. Trains which run from Carlisle to Edinburgh runto the east of the station on a curve which is not served by platforms. Trains which stop here on route to Edinburgh have to reverse to continue their journey. The station building here has been demolished and a new one has been built. The station building was of a similar style to those which stood at Eglinton Street and remain at Gleneagles. The new station, although much smaller, is probably much more suitable for this station. The recently demolished building's predecessor consisted of a complete train-shed (in wood?) whith an island platform inside. This is a coal loading point for coal from the Douglas Basin. It is also known as "Renstrie". The picture above shows the depot under construction. This junction faced east and was formerly used by trains from Lanark to Edinburgh. The curve to the Lanark Branch (Caledonian Railway) is now lifted. This junction faces west and is used by trains from Glasgow to Edinburgh. The curve to the Lanark Branch (Caledonian Railway) is still in use. This was the location of a signalbox. This was a junction with a connection from the Wilsontown, Morningside and Coltness Railway to the west of Carluke. This line ran from here to Castlehill Ironworks and then on to the main line of the other railway. This is the junction for the Wishaw Deviation Line which runs from here to near Holytown on the Shotts line. There was a station here but this is closed as is the Cory Distribution Depot by the junction. This is the present name of the former Dolphinton Junction. Here the lines from Glasgow and Carlisle meet and continue to Edinburgh. This was also the junction for the Dolphinton Branch. This was the north end of a Edinburgh to south avoiding curve which was reputedly only used by one train containing Queen Victoria. This station is closed and demolished. Some small portions of platform can be found in nearby bushes. The station house remains standing here on the West side of the line and to the North of the level crossing, which has automatic barriers. 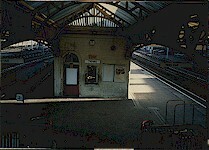 The station had two main platforms with a bay platform on the Northbound platform for trains to Wilsontown. This junction faced south towards Auchengray. This was the junction for the Wilsontown Line (Caledonian Railway). This junction faced north towards Edinburgh. This was a junction for the Wilsontown Line (Caledonian Railway). This junction seems to have fallen out of use before the branch was closed and the link retained a siding on the branch. There have been two stations at Cobbinshaw. There are no stations now. The line is joined by the Caledonian Railway's Cleland and Midcalder line (Shotts line) at an east facing junction which allowed the Caledonian Railway to compete with the Edinburgh and Glasgow Railway's service without having to go via Carstairs. Oddly enough the Carstairs route is now used by many express trains (as the Shotts line is not electrified) but there are plans to electrify the Shotts route. This station is open. There is a level crossing here where road users frequently 'jump the lights'. A traffic camera has been fitted. This siding may be presently out of use. The siding joins the main line at a west facing junction and is to the south of the line. This was the junction for the Caledonian Railway's Balerno Loop which is now closed. The junction faced west. This is a re-opened station. Nothing remains of the original station. The station is provided with two bus-shelters (one on each platform), bicycle lockers and a generous carpark. This station is built at the back of a shopping centre in Wester Hailes. This is an older station. To the west of the station is a level crossing. A stationmaster's house remains on the North side of the line by the level crossing. This junction for Balerno faced east towards central Edinbugh. There were some refuge sidings on the south side of the main line which were accessable via the Balerno Loop (Caledonian Railway) line. This junction faces West. It provides a link to the Edinburgh Suburban and Southside Junction Railway and was built by British Railways. This was a temporary station built on a short branch for an exhibition held here. After the exhibition finished the station was removed. This junction faces west; away from Edinburgh towards Carstairs. Here the Edinburgh Station and Branches (Caledonian Railway) (connects to Haymarket on the Edinburgh and Glasgow Railway) line meets the main line from Carstairs to Edinburgh Princes Street. The junction also gave access to the Granton Branch (Caledonian Railway) which branched off the line to Haymarket. Today there is no longer a junction as the line to Princes Street has closed and all traffic takes the line to Haymarket. The trackbed between Slateford and Princes Street is covered by roads. At Merchiston is the road access to Slateford yard. This yard is open and is located to the south of the line and is accessed from the west end. The old signalbox still stands here, but is today a signalling training centre for First Engineering. This station is closed. The trackbed here carries the access road to Slateford yard. These are closed. The trackbed carries the Western approach road. This junction is closed. The junction faced East towards central Edinburgh. The trackbed carries the Western approach road. The Dalry Road Line (Caledonian Railway) connected the line to the Granton Branch (Caledonian Railway) and the Edinburgh and Glasgow Railway. This is closed. The station hotel, The Caledonian, remains open. This south facing junction with the Monkland and Kirkintilloch Railway is now closed. The signal box has been removed to Bo'ness where it forms the station signalbox. The Caledonian Railway ran briefly over the metals of another company on it's main line from Carlisle to Aberdeen between Gartsherrie North and South Junction. It considered its own route between the two, and had an Act of parlament to approve it, but did not open its own route. Here the Hayhill Branch (running from Gartcosh on the Garnkirk and Glasgow Railway) joined the Caledonian's Castlecary branch. This branch was built by the Caledonian to save Glasgow to Stirling (and other destinations) trains from having to make inconvenient reversals at Gartsherrie. The station has been demolished. The signalbox here has been closed. The once world famous Glenboig Brickworks Company was located by the station, however the site is now derelict. This signal-box has been demolished. [Approx 28/04/1999]. There is a level crossing here. This is a relatively new station serving the south of Cumbernauld. 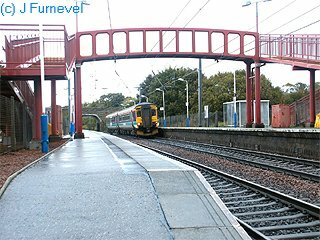 This is the terminus for services from Glasgow (via Springburn and Stepps) and Motherwell (via Mossend yard). There is a down refuge siding here which the terminating passenger trains run into while the points and signals are set for the train to run into the Southbound platform. At my last visit the Signalbox was still extant (the oldest in Scotland) but was shortly to become out of use and be demolished. The box was subsiding at the rear. At Greenhill Lower Junction the Caledonian Railway (on the left) is joined by a spur from the Edinburgh and Glasgow Railway (Right) and then continues on to Carmuirs west Junction (route of the Scottish Central Railway). At Greenhill Lower Junction the line has an end-on junction with the Scottish Central Railway. The Bonnybridge Canal line started from here. The junction faced west and the line curved north to the station.